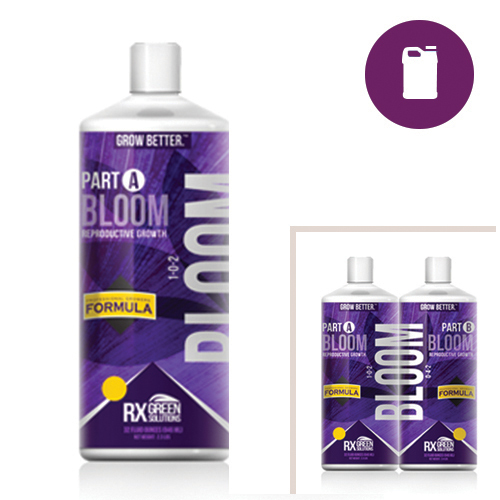 Bloom Part A (1-0-2) is part of Rx Green Solutions' 4 Part Professional Nutrient Series. Containing a unique blend of nutrients, natural ingredients, and patented technologies, Bloom A optimizes reproductive development by helping the plant take in and protect phosphorus sources. When combined with Grow A and B and Bloom B, all essential micro- and macronutrients are delivered to the plant at optimal levels, and no additional additives are required. These professional quality products have produced stronger plants and greater yields in various trials and are now used by several large-scale commercial growers across the country. Increases plant biomass, yield, dry matter and fruit set.